February 9, 2011 – Rich with information and inspiring, INGREDIENTS tells the story of America’s local food movement and the chefs, farmers and activists who are revitalizing our broken food system. From innovative farm-to-table programs in New York to picturesque sheep farms in Oregon, INGREDIENTS gets to the roots of an alternative food system – healthy and sustainable. American food is in a state of crisis. Health, food costs and our environment are all in jeopardy, but a movement is steadily emerging: What began 30 years ago with chefs demanding better flavor has inspired consumers to seek relationships with nearby farmers. Narrated by award-winning actress Bebe Neuwirth, INGREDIENTS illustrates how advocates coast-to-coast are working to bring good food back to the table and educate our communities about the nutritional, economic and social benefits of eating food grown close to home. Peter Hoffman (Savoy, Back Forty); Jean-Paul Courtens (Roxbury Farms); Frank Morton (Wild Garden Seed); Gary Paul Nabhan (Renewing America’s Food Traditions – RAFT); Joan Dye Gussow (Columbia University); and Alice Waters (Chez Panisse). “Local food is the most interesting trend of our time–towards the real, away from the fake; towards work, away from convenience; towards satisfaction, away from gratification. This film captures the intrigue,” said Bill McKibben (Deep Economy). 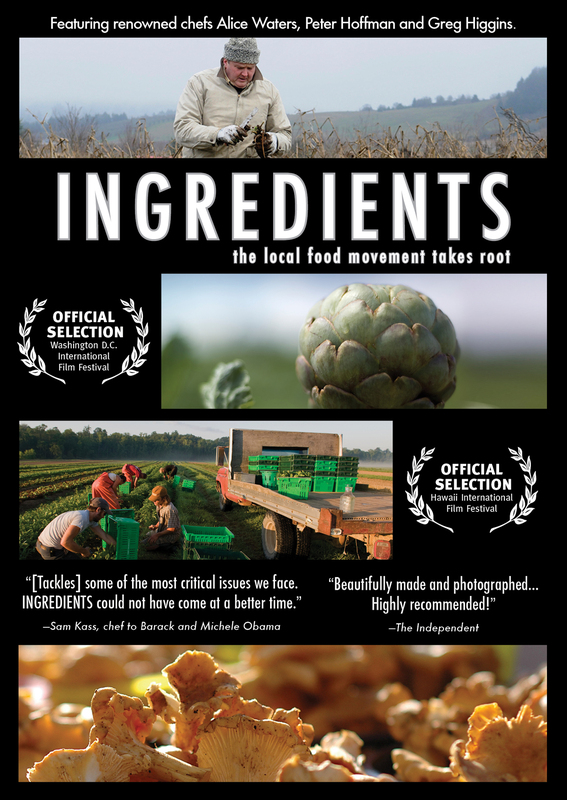 INGREDIENTS has been an official selection at several international film festivals, including The Colorado Environmental Film Festival, the Cleveland International Film Festival, the Kansas International Film Festival, the Princeton Environmental Film Festival and the Washington, D.C. Environmental Film Festival, Hawaii International Film Festival, and Hot Springs Documentary Festival. The DVD features an extended interview with Alice Waters, slow food vs. fast food analysis, and four seasonal stories. INGREDIENTS is directed by Robert Bates; produced by Brian Kimmel; written and edited by Robert Bates. Corinne Bourdeau and Mary Elizabeth Murphy, executive producers.